Surprise! For millions, state laws hang community rules out to dry. As we and others have said, hundreds of thousands of people across Cascadia—and tens of millions across the United States—live where homeowners associations (HOAs) (or apartment or condo rules) ban clotheslines. Clotheslines are a quintessentially sustainable tool that saves money, prolongs the lifespan of laundry, and eliminates pollution. A “right-to-dry” movement has sprung up and won laws in six states––Florida, Colorado, Hawaii, Maine, Maryland, and Vermont—to render these bans void and unenforceable. In another 13 states, I have discovered to my surprise and delight, solar access laws already on the books appear to protect solar drying. Yet in all of these 19 states, illegal bans persist in community rulebooks, such as HOA Covenants, Conditions, and Restrictions (CC&Rs), and a number that likely runs into the millions of residents do not know they already have a right to dry. Solar access laws, many of them from the 1970s, and obscure amendments to state property law hardly fall in the category of common knowledge. When Sightline sent out an email alert asking people to let us know about bans where they live, over a third of responses came from inside these 19 states. In the map below, I have marked clothesline bans that readers notified us about (keep telling us about more by writing to [email protected]!) or that I have found in other ways. The explicit right-to-dry states are those with blue pushpins marking clothesline bans. Of the 220 bans marked on the map as of today, 26 are in states that specifically mention clothesline bans as void. The solar-access-law states are those with yellow pushpins marking bans. Some 103 bans are in these states. The two green pins show bans in Utah, where individual land-use authorities may protect the right to dry. While laws in Delaware and New Jersey allow for roof-mounted solar systems and Washington law overrides bans on solar panels, these states and 27 others have no legal protections for solar energy generally or clotheslines specifically. In these states, marked in red, the right to dry is not yet protected. View a larger version of our map of clothesline bans. Consider one example: The Forest Heights neighborhood, Oregon’s largest ever new-home community, is located in Portland’s posh West Hills. The community boasts over 1,600 single family homes, covering 600 acres. A pillar of the Forest Heights marketing campaign is environmental stewardship: the HOA website boasts that the community has set aside more than a third of its acreage as common green space, complete with seven walking trails and a private pond. The website promotes a “Go Green” campaign and offers residents an “EcoShuttle” service. 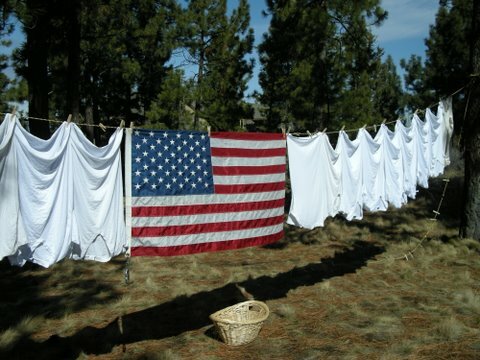 Clotheslines appear to fit under the umbrella of Oregon’s, and other states’, solar rights because systems for hang-drying rely on the sun’s radiation to evaporate water in wet laundry. Clotheslines rely on solar energy, so their use is protected where laws provide blanket allowances for use of solar. In addition to Oregon, the solar access laws in Arizona, California, Illinois, Indiana, Louisiana, Massachusetts, Nevada, New Mexico, North Carolina, Texas, Virginia, and Wisconsin all delineate a homeowner’s right to install a “solar energy system,” “solar energy device,” “solar collector,” “system for obtaining solar energy” or “solar energy collection device.” The legal terminology varies, but the letter and spirit of these laws has one overarching message: homeowners may utilize the power of the sun. Nationwide in the United States, more than a quarter million homeowner associations govern upwards of 60 million people. Alexander Lee, a champion of the right-to-dry movement, estimates that “more than half of them (HOAs) restrict or ban the clothesline.” If he is right, tens of millions of Americans are subject to either full or partial clothesline bans. Some 19 states, including populous ones such as California, Florida, and Texas, have right-to-dry laws. These facts combined suggest that millions of Americans live under illegal clothesline bans. Love this article? Read more about clotheslines here. So spread the word! If you live in any of the states listed below and HOA rules have hampered your drying, take heart. The law was on your side all along. 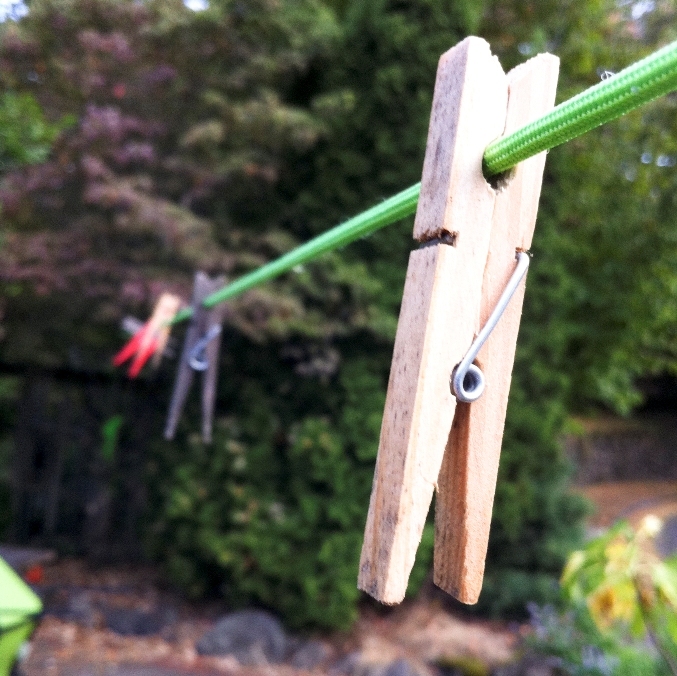 When Spring arrives, grab your clothespins and laundry basket, string up a line and hang out the wash. If anyone hassles you, point to the relevant statute. The table below specifies chapter and verse for each right-to-dry state. The worst that could happen is that you might become part of a test case—a law suit that cements the right to dry in your state. * Utah has clothesline-specific protections under the jurisdiction of some land-use authorities. Jon Howland is a Seattle-based teacher, debate coach, and Sightline volunteer. Alan Durning edited this post. This is such an important article. Its so important to point out that although their are laws in place to protect the homeowner that doesn’t necessarily mean they will be able to line dry without it being sighted as a problem by their community. if you love the clothesline it might be worth your while checking it out. Unfortunately the law does not state you have the right to have a clothesline or other solar device if you live an a apartment. We are in a mobile home and rv park 8n a mobile home in Arizona. We rent the land and own the home. Management has informed me that I am not allowed to put up a clothesline. The excuse for the rule is that they don’t want the park to look trashy/like a trailer park. In this extremely dry climate clothes dry in minutes and many of my clothes must be line dried. Does Arizona law protect my right to line dry? Hi, Carol. From the above article text, and from this Arizona law, it appears your manager has no legal grounds for restricting your solar drying access. Enjoy your clothesline! They can try to take our solar, but they can’t take away our freedom… to clothesline. One tip – when the weather is not clothesline friendly, move it indoors. It works and all you need is a shower type rod, brackets to hold it and plastic coat hangers that you probably already have. it takes about 8 hours to dry the heavy cotton and lessens your need for the dryer by 70%. put it over your washer/dryer if you can. it’s slow drying but will do the job when outside won’t. I work in the Low-Income Weatherization Program in northwest Washington State, and I’m afraid I have to take issue with the recommendation of drying clothes indoors. We regularly see homes with indoor moisture and mold problems that are caused or exacerbated by drying clothes indoors, particularly during cold weather, and recommend to the occupants that they not do it. The energy savings achieved by doing this are very likely to be negated by the costs of health problems such as asthma that can be triggered by mold, dust mites, and other indoor air pollutants related to high humidity. The energy savings are also partially offset by increased heating fuel consumption, because it takes more energy to heat moist air. Likewise, in homes where dehumidification and/or air conditioning are frequently used, the savings for drying clothes indoors are offset or even negated by the increased energy it takes for the AC to cool the moist air or the dehumidifier to remove the moisture. I suspect a nuanced approach is appropriate for balancing energy savings and indoor moisture concerns. For example, I use a front-loading washer that spins clothes until they are not terribly wet. During the wet season in the Northwest, I hang dry, indoors, about half of my clothes — mostly the things that dry well and would deteriorate more quickly from using the dryer. Even in the summer, I hang dry some of my clothes indoors when the outdoor lines are full, or when I don’t want to hang something in direct sunlight. I often crack the window in the basement room where I hang up laundry. But I don’t always do so: Indoor air in my house in winter is exceptionally dry, because the outdoor air is dry in winter and when it’s heated by my forced-air heater, it can absorb a lot of moisture. The heating system also ensures a fair number of air exchanges per day, reducing moisture problems. My own observation is that indoor moisture problems — fogged up windows are one indication — are most likely to stem from lots of people showering and failing to run the bathroom fan. Cooking can do it too. Hanging up laundry seems unlikely to put as much moisture in the indoor air as those activities. But perhaps you can provide some evidence of the quantity of moisture introduced to the indoor environment by hanging clothes dry? Obviously, a certain amount of air drying is fine: everyone hangs their bath towels and kitchen towels. That’s not a health risk. So how much hang drying, in what circumstances, is actually a problem? I think most adults can figure out if the time it takes to dry their clothes is causing moisture problems. Because of health issues I can’t carry heavy loads of laundry up the stairs and out to the lawn, but after a wrinkle release spin in the dryer, I can hang clothes on hangers that will be hung in closets and use drip hangers for the rest. My clothes dry faster indoors than they do on most days outdoors because of the humid weather. I have a nice dry basement. There is a really quick way to figure out how much water is being added to the air: grab all your went laundry and stand on a scale. Once it’s all dry, weigh yourself and the laundry again. 1 pound of water equals 0.12 gallons. Can you imagine, mounting legislation in state after state for the right to hang clothes on the line? Our government is getting too complicated. There must be some way for us to simplify our lives. I wouldn’t want to go back to the farm but cities need to be decentralized so that people have more control over their own lives without too many levels of government rules and retulations. The argument from HOAs is that people agree to certain conduct in the CCRs. That is, they give up certain rights (say, to paint a house any color you want or to hang a line) to gain the privilege of living in that development. It’s then only a contract dispute, not a matter of rights. I don’t like this argument, but it seems to hold up in court. The only exceptions I’m familiar with are those dealing with CCRs based on race or religion. Outside of that, courts just won’t even consider the case. Am I wrong? Have you seen case law that says otherwise? I think you’re right about the argument made by HOAs. The rationale behind that argument is that clotheslines are an eyesore that decrease property value. I’m unaware of any actual evidence that establishes this casual relationship, but I digress. The exceptions you bring up — race and religion — are just two of many examples. Here in Washington State, HOA bans on political yard signs, hanging American flags, and installation of solar panels are all rendered void by this state law: http://apps.leg.wa.gov/rcw/default.aspx?cite=64.38&full=true. States can, and do, limit the reach of HOAs. Six states have specifically named clotheslines as one thing HOAs cannot restrict. I’m not sure of any court cases in these states, but the HOAs wouldn’t have a leg to stand on since the law is so clear. Another 13 states protect the use of “solar energy devices” or “solar energy systems” or so forth. The point I’m making in the article is that laundry on a clothesline is being dried by solar energy, so clotheslines are covered by these sort of solar access laws. In regard to this article (and thank you all so much for all your work on this! ), I live in Vero Beach, Florida in a HOA mobile home community. Being Florida is now a right-to-dry state, can my HOA still prohibit me from hanging out my clothes to day? Cause they do. In fact, your HOA cannot prohibit you from hanging out your clothes. You can point them to Florida Statute 163.04. Florida’s law is looked to as the model, nationally — it offers the strongest protection of any state in terms of using clotheslines. I live in Ft. Pierce ,Fl. I live in a mixed com. of mobile homes and cbs homes. I do not own the land that my cbs home is on. I do pay taxes on the land.the land owner do not allow clothes lines. My question is this ,if i dot own the land can i still have a clothes line? thank you . You may want to check with a local attorney, but the Florida statute is pretty clear. Landlords cannot ban clotheslines. The law says you can use “solar collectors” and defines these as devices that rely on sunshine as an energy source and can collect at least 25,000 BTUs on a clear winter solstice day. A clothesline can collect much more than this. Electric dryers don’t generally measure their energy use in BTUs, but natural gas clothes dryers do: the designs I’ve seen use upwards of 20,000 BTUs for one load. And, even on the shortest day of the year, a clothesline could dry several loads of laundry. What’s more, outside this BTU requirement, the law protects your use of a device to heat water — that’s how clotheslines work, the sun evaporates the water in wet laundry by heating it. So, I think you’re doubly covered. I’m not a lawyer, so I can’t recommend bringing up these facts before or after closing… I also don’t know any lawyers in New Mexico, but I’ll ask around. Good luck! And keep on hanging out! So This is a bit confusing. I rent an apartment in California. The landlord told me today that I am no longer allowed to line dry clothes. Is this legal? Am i protected by the right to dry or do I have to stop? I am not good with legalese and would appreciate a translation by someone that understands my rights. Thank you! Might I add that we are also “not allowed” to make any holes in the walls or hang or mount lines inside. I have a toddler that makes drying racks pointless to use. My reading of the California Civil Code is that it protects owners but not renters. So you may be out of luck. I live in Jacksonville, Florida and for a week now have to battle for my “Right To Dry.” I am getting nasty emails after posting FL Statute 163.04 to provide the law that gives me that right. I have been reading countless online reports on this issue. I KNOW I am right and told them to uphold/defend the old covenant is specifically prohibited. To circumvent any excuses for prohibiting me from putting up clotheslines I even turned my request in to our Architectural Review Board–not to ask if I may put up a clothesline, but to get the location approved. I’ll have to wait for their answer. I cannot find any reference to whether or not our HOA can tell us if we have to remove the clotheslines every time we’re done drying outside, what we can hang out there or not, the material of the contraption, or the length. From what I can tell by some emails I am receiving, our HOA director would now be trying to go about it with those restrictions. FL Statute 163.04 is not specific enough to answer my questions. Is there anyone out there who can help? Thanks for posting and I’m sorry you are having to go through this with your HOA. FL Statute 103.04 does indeed protect your right to “install” a solar device, including a clothesline. So, my reading of the statute (though I’m not a lawyer) is that you can leave the clothesline up. And the intent of the law seems to point toward your right to hand dry whatever you want to. I’m in JAX too and our HOA states no clotheslines as well. Both I and my 85 year old neighbors have a line in our fenced in backyards. I was told as long as things can’t be seen from the road, no one should bother you. Good to know the FL statute in case some one says something. We have an energy star dryer and I already seen big savings when I line dry. Sometimes I am inspired by the way the United States protects freedoms.Sometimes(I should say often in especially in the last 11 years),I am puzzled whether the U.S is going to become another Soviet Union that I once ran away from.No offence to US citizens.Just my opinion. If only we had common sense people (like the ones that run this site) in congress, a lot of our problems in this country would be solved. I can’t tell you how excited I am to find this article. We’ve just endured three 105+ degree days in Charlotte, NC. I’ve had it with the bogus HOA rules that means my dryer is running as I write this note…adding to my electrical bills and heating up my house that I’m paying to air condition…this is utter nonsense. Do you have a recommended way to approach HOAs? Just put the clothesline up and then argue with them? Or, be proactive and give them time to come up with a ridiculous argument? Or, offer to be helpful and give an example of “clothesline rules” e.g., retractible, not seen from the street, etc? Just great information on the clothesline poles. We custom build, design and install clothesline poles for The Charlotte NC metro area. Great to see someone who takes and interest in this. I’m a little bummed about living in a condo in IL. The Act referenced specifically does “not apply to any building which is greater than 30 feet in height” (Section 45 = the last section), which seems overly broad. Not that there are any place to implement a clothsline in my building anyway. Oh well, one day I’ll get a real house. Great! Now we need an altrnative to PVC coating on clothesline. City living deprives many people of the village feeling where people live closer to the earth and enjoy down to earth living. restrictions is ridiculous. Now if we barred gas guzzling and exhaust spewing cars in the city limits, that would be OK. There is already a wide acceptance of clotheslines in Pennsylvania, I run a small business Breezecatcher clotheslines, for the past few years Pennsylvania and California have topped the sales league. If you ever do get around to purchasing a clothes line visit http://www.breezecatcher.com and type ‘ no-ban-here ‘ in the coupon box to receive a 5% discount. I live in Missoula, MT, generally a community known for it’s push for sustainability and support of local organic farms. I just received a notice today that my neighborhood association doesn’t allow clothes lines- something I was not made aware of until having a clothes line for five months. I’ve contacted a neighborhood liaison through the City of Missoula-is there anything else I can do? As far as I know, Montana doesn’t have a law protecting this right…probably because most Montanans could care less if their neighbors hang their clothes to dry. The Virginia solar access law seems to only apply to restrictions placed by HOAs on or before 2008. If our clothesline ban predates that, am I (pardon the pun) S.O.L.? Fairway Villas Homeowners Association located in Hudson Florida has not amended its Declaration regarding clotheslines, which state that clotheslines are not allowed. The association has been aware of the Florida Statute for over two years and no amendment to change this to comply with FS 163.04. The association is now trying to change the Rules and Regulations stating that only umbrella type clothesline is permitted in the backyard only and drying is not permitted on Sundays and Holidays. Florida Statute is very clear that HOA’s cannot control of restrict Clotheslines. What do you expect, did you expect an Homeowners Association in Florida to comply with Florida Statutes, Florida cannot even count votes in a proper manner. As someone who has gone thru a fight and litigation with my Florida HOA, I have some knowledge regarding this issue. First, you indicated that you are Declaration of Covenants and Restrictions have language that does not permit clotheslines. Your HOA is or has changed the Rules and Regulations regarding clotheslines, some rules can be made regarding this issue, but not days and time this would be CONTROL and violates Florida Statute 163.04. In addition, any change must be made in the Declaration since that is where language regarding clotheslines. When a conflict arises between the By-Laws, Rules and Regulations, etc., the Declaration is the prevailing document. Therefore, any Rule change that conflicts with the Declaration is not enforceable, when the Declaration is in Conflict with Federal or State Law, the Federal and State Law prevails. Depending on the size of your HOA, you may want to hire a Management Company to advise your BOD on these issued. In addition, I have won the case in Arbitration but I have since filed suit for all of my legal fees, which my HOA is refusing to pay. Stay tuned. I owned property in Timber Oaks in Hudson Florida and have since moved. Our HOA sued a homeowner several years ago for a clothesline. The BOD of directors decided to file a lawsuit against a homeowner because our Declaration was clear that no clotheslines were permitted. Our BOD and attorney was not aware that Florida had a statute allowing clotheslines. In short the homeowner prevailed in the lawsuit and the cost to our HOA was 26K plus our incompetent attorney received his fees. Really trying to understand the laws in NC. After searching the web, it seems like we are able to use a clothesline, however, in the last 2 weeks, there have been 2 different cases where the HOA’s won. Any help out there? We are in Wake county. I am British so grew up drying laundry outside. I moved to West Orange, NJ 12 years ago and lived in a condo situation where clotheslines are banned. This community does allow you to install solar panels though! I have since moved to Essex Fells, NJ and live in a regular house (no HOA). I really want to dry laundry outside when possible. When I checked with another Essex Fells resident to see if drying laundry outside was allowed she informed me that it is not allowed. Any ideas as to where I need to go to find the law that prohibits the use of a clothesline and any solar panel laws for my town? I’d like to see them for myself and then to do what is needed to change these laws. Many thanks for all you are doing here. I got no relevant hits searching on “clothes”, “dry”, “laundry” or “line.” If there is an ordinance against clothes lines, it doesn’t include any of those words. Sound to me like the person you talked do was “misinformed.” If I was you, I’d start drying my clothes outside. But if you want to be sure, just call up city hall and ask what permits you need to dry your clothes outside on a clothes line. If someone says that its not allowed, ask them for the specific citation in the municipal code. If they can’t tell you that, they’re blowing hot air that is too fetid to dry clothes with! I am public health professor – a specialist in obesity – and British, and was curious to know what Americans don’t hang out their washing. Having been in Houston, Tx, I inquired with my professor friend why he took his clothes from the washing machine and put them in a dryer – when it was over 100F outside. And why did no one else? Several reasons: one – habit – in a place where energy is seen as almost free; two, progress, washing line is ‘what our parents did’; three, local ordinances (possibly); and four, convention: our individual behaviour is shaped what other people do (so much for ‘individualism’!). This is a mix of shaping factors on behaviour which produce a kind of behavioural ‘lock in’. What is striking about this is that Texas makes a big deal of ‘freedom’, rights to bear ‘arms’, limited government, etc. What people really need perhaps is the right to bare arms and to employ washing lines. Instead ‘Progress’ (ie consumerism) is killing the planet and killing the sociability that society is built upon. In the Houston suburbs, I note, all the lawns are weed free and the back yards are bare. Like a cemetary. Please keep up the good work. The US is the heaviest user of energy/producer of C02 on the planet – but more than that it is a point for aspiration for many other societies. It is vitally important that culture is dramatically changed to redirect energy use in a different direction: ie human energy rather than fossil energy. For me, as an obesity prevention specialist one of the ways (besides changing cars for bikes) to reduce the US’s massive obesity problem is the use of many simple measures. Hanging out your washing is one. So I get this clear I live in Hawaii and I was trying to understand the Hawaii bill that was passed. So my HOA cannot stop me from putting up a clothes line? Currently they are telling me tat it is against the association rules to have a clothes line. Placement of clotheslines. (a) Notwithstanding any law to the contrary, no person shall be prevented by any covenant, declaration, bylaws, restriction, deed, lease, term, provision, condition, codicil, contract, or similar binding agreement, however worded, from installing a clothesline on any single-family residential dwelling or townhouse that the person owns. Any provision in any lease, instrument, or contract contrary to the intent of this section shall be void and unenforceable. Hi! Do you know what restrictions the state of Kentucky has about line drying? I received a letter AND a picture of my patio of 2 sweaters drying outside and told its against the bylaws of the HOA. Do you know if we’re a solar access state? Thanks! I don’t understand why people would want to ban such beneficial method of drying clothes. To be honest, I’d prefer to line-dry rather than use dryers. I noticed that Oklahoma is not listed among the states with laws in place. What is your recommendation for where to begin that process? Is there anything already in the works? Please help. I own a beach house in destiny west subdivision in DestinFlorida. I put out 2 clothes lines approximately a year ago to dry my beach towels and linens. At that time hoa had no covenants concerning clothes lines. Sept 2013 the board enacted new clothes line laws. February 14 2014 I received a certified letter from the hoa declaring that I owed 5000.00 in fines due solely to my 2 clothes lines. I did not receive any notification until 2/14/2014. According to them they mailed letters to my business address and completely missed them. In November 2013 and December 2013 they fined me a total of 5000.00. Wow, Peggy, that is awful! The HOA is clearly breaking the law. Have you tried getting in touch with local media? Perhaps take heart from this story in the meantime. And don’t give up! You’re right! Notice (3). I suggest you print out a copy of this law and the letters you’ve received from the HOA and go find an attorney. Make sure the attorney sees (3) in the law. Then send a copy of the law to the HOA. Then hang out your clothes. County and have a neighbor who insists hanging her laundry over her porch which obstrucks my waterfront view. I pay dearly for that view and wish she would put it in her back yard instead. Is there anything I can do? Asking has gotten me nowhere. ” 1. “Collector” means a component of a solar energy device that is used to absorb solar radiation, convert it to heat or electricity and transfer the heat to a heat transfer fluid or to storage. A clothesline meets the definition of “solar energy device”. A clothesline is a system, designed to provide heating, on which solar generated energy is collected and transferred, as heat, to clothing by passive means. If you disagree, please explain why you think a clothesline doesn’t meet this definition. I would love some verification here. I live in SE Portland, in an older neighborhood (our house was built in ’56). We do not have a HOA. Are there any restrictions for building a clothesline in our area? Portlandline.gov is no help. No HOA means no restrictions! I live in a HOA in California where CC&R contains Solar Access Law Civil Code 714 as well as clothesline ban. HOA attorney argues clothesline doesn’t fall into definition of solar energy system. I’m hoping to reach middle ground by increasing fence height/coverage to obstruct sight of my clothesline but so far I haven’t been successful and I’ve been threatened already having to pay for any legal fees if I continue to dry on clothesline. Hello! About Texas House Bill 362, it only mentions solar energy device but nothing about clothesline. The manager of the apartment where I live, told me I will need to pay 100 fine if I air-dry clothes on the patio. I am not sure what I can do cause on the contract I signed before I moved in, there are rules like this”the apartment office regulate the patio”. Please help. Sorry. We have no expertise on Texas to share. In many states, there’s an argument to be made that clotheslines are de facto solar energy devices, whether they are mentioned in code or not. And we don’t know what organization to recommend in Dallas for help with energy savings. Just a belated note–in the process of rewriting some ACC Standards and Guidelines here in Colorado I noticed that Jon Howland’s reference to Colorado’s Common Interest Ownership Act and its voiding of clothesline bans should refer to Section 38-33.3-106.7, not 107.7. The reference has been picked up in several blogs, so it might be worth changing. My husband and I recently moved into a manufactured home community in Leesburg, Florida, and were told clotheslines were prohibited in the covenants. I printed a copy of Florida Statute 163.04 that clearly states such a prohibition is unlawful, and the park manager sent it to the corporate office, also in Florida. Their response? A reminder that we signed a a pledge to adhere to the covenants, and one of those dictates that clotheslines are prohibited. As I type this, I have sheets drying on a clothesline erected in a discreet location behind my home, and plan to leave the clothesline there until the covenant cops show up. If push comes to shove, I’m wondering if there’s some legal loophole they can use to force me to take it down. Otherwise, they are telling me that by signing their covenants, I agreed to break the law! Am I way out of line, or am I correct that the Florida statute protects my right to dry? The Florida statute is quite clear and enjoy drying your clothes in he sun. There is a long established legal principle that a private contract can’t compel people to break the law or override a law that allows them to do something. Examples include racial or religious discrimination in renting or selling and cutting trees on unstable slopes (for view enhancement) when local regulations prohibit this. Steve — Thanks for replying. Good advice! Carole — Thanks for your story. You might also find that you can contact local media outlets and generate heat on the management company for less money than hiring a lawyer. Whether for legal or media strategies, document everything. If “covenant cops” actually show up, for example, take video. I set up a yearly event called International Clothesline week about 10 years ago with the intent to have people not only save a little energy but even to think about alternate sources. Every once in a while I update the webpage that details the week and occasional check Google to see if anyone is bothering to participate. Each year, always to my delight and amazement, I find many individuals, communities, cities, and larger dedicating a week to this event. Very good! Keep up the positive work! I live in Arizona and the HOA asked to me remove clothesline quoting that the house is not ‘aesthetically’ maintained. I am a tenant and a non-US citizen and had to abide by their notice fearing those ‘fines’ and credit reporting. I can comfortably dry clothes like I do in my home country year round owing to the beautiful Arizona desert climate. I would like to know if I can challenge future HOAs in case of a notice the next time I dry my clothes outside. I always wonder the irony: people fly from all over the world to a place to discuss issues concerning environment and sustainability and yet developed nations prioritize ‘aesthetics’ over nature. I live in Pembroke Pines, FL. I have been hanging some clothes outside for an hour or two on weekend a.m. I put the clothes on hangers and then hang them from tree in front of house on my property. I received a ticket/violation notice from HOA. A tree is not a clothesline, however an HOA board member (who I kindly asked to talk to the HOA attorney)also expressed that we are a “private” community that prohibits clotheslines. Of course, I cited the Florida Statutes. Can the hangers I use be considered the “other energy device”? Also, my small back yard does not get as much sunshine as the front, due to lines of townhouses on both sides. Can the HOA limit me to clothesline in the backyard? Can the HOA limit the type of clothesline, location of hanging the clothes, and times when clothes can be hung to dry? Any legislator or attorney you know that could assist for free? Thanks! Hi, Debbie. You might want to direct your questions to Project Laundry List, since they’re working on this issue more closely now. Good luck! I’m totally in favor of outdoor drying, but…. do it in your backyard! I live in Baltimore, & there is one person in our community who weirdly insists upon hanging their laundry in their front lawn — corner lot — so everybody gets a really good view of their sheets and undies, etc. Geez! It looks horrible & I feel it diminishes the property values. Hang laundry in your BACKyard!!!!! I am an international student in Denver colorado. I often dry my clothes on my balcony. Yesterday my neighbor told me I can not dry my clothes there. Could you tell me if I am wrong or not? In my country we always dry our clothes use solar energy. It can save energy ，reducing pollution。People always propose to protect the environment. Why they can not consider to dry clothes nature. The condo laws in Michigan are dated 1978, with no mention of solar drying. I live in an attached condo with 2 units per building. We have individual decks that are limited common property on which I have put a hanging rack. I hang, on hangers, clothes for about 2 hours switching them in and out about twice a month. Iv’e done this for 9 years with no problem, and now that the builder is gone, the Board has run wild with power. They’ve sent an attorney letter informing me, that they are seeking an injunction, and I would have to pay ALL their legal fees. There are only 2 people who can see the rack, and one of them is ON the Board next door with whom I had a very good relationship until I refused to seek permission letters, back dating various things that everyone had installed. I have sought to have the Michigan condo laws brought up to date by Legislators to no avail. They have more important matters to take up as they say. 1978 Cond. Laws are archaic! It does state in the By-laws that I can’t dry/hang laundry, yet the Board member used to do so, until last year. What does the Federal Law say about solar power on a limited common area? I’m having difficultly finding anything, yet I read it somewhere that it was allowed. Unfortunately the law does not state you have the right to have a clothesline or other solar device if you live an a apartment. No matter the state. i’m from california but have lived in scotland for years. i never knew until today that clotheslines were banned anywhere in the usa (my parents always used a dryer, and all my adult life i’ve lived in europe and used a clothesline). but my reading of the california law you quote refers to installing and using “solar energy systems.” now i grant that i totally get how you interpret a clothesline as being a solar energy system, but i don’t think that is what was meant, i would think they meant something like solar panels. or is there some piece of legislation defining a clothesline as a “solar energy system” by which someone could defend their clothesline use using this law? California is just changing that — AB 1448 — to be clear that tenants and members of a home owners association have (some) rights to use a clothesline/drying rack. I’m in Md and trying to figure out if my HOA’s rule that a clothesline has to be removable is allowed. Our law states that HOA’s can reasonably restrict size, placement and appearance. I feel it’s unreasonable to tell me I have to take my line down when not in use. They also restrict hours but I know that’s not legal anymore. Any help? Thanks. Are there any restrictions for those of us in Cincinnati, Ohio? I’m thinking we don’t have a ban on cloths lines in Ohio but if you live in a HOA I’m sure they do. We need a bill signed for the Right To Dry in Ohio that will over rule the HOA’s. For most residents it is impossible to invisibly hang their laundry outside. As a result, this HOA restriction is a ban on hanging laundry. The ban’s language about 163.04 is nothing more than an attempt to confuse residents, by implying the ban is legal. Just a thought from over here in Australia. Surely these are restrictions against the laws of nature, as well against our right to use and enjoy our own property. If man makes laws saying one HAS the right to do certain things, isn’t this also agreeing that we don’t have a natural right to those things, and therefore laws can be made either for or against them? If we agree to the making of laws allowing something to be/ be done, we are also agreeing that in the future sometime those same laws can be changed to forbid it. I believe that where the battle should be fought is against a law of any kind being made about our natural God-given rights in the first place. What if one day the government or anyone else made a law to say we are allowed to breathe the air around us, either with or without a license? Wouldn’t we say that was absolutely ridiculous? What would we do about it? The government has not given us the water that falls from the sky, the air we breathe, the bodies we live in, the wind that dries our clothes and cools our bodies, the soil that grows our food, the herbs for health and healing, or the earth on which we live. The problem is that we (well, our ancestors usually) allowed governments to take our rights from us little by little so we didn’t notice it happenng, then dole them back as a kindly gesture, make us pay for them, or forbid us to use them, as though they owned them. But it is never too late to claw back whatever of our God-given rights that we can, and to stand strong and say “No way. We will not allow you to do that” when it comes to any further theft of our natural rights. In 2010 Governor O’Malley signed into law Maryland SB 224, the so-called “Right-to-Dry” legislation, which requires condominium associations, homeowner associations, and cooperatives to allow homeowners to install clotheslines on their property. The new law, effective on October 1, 2010, adds section 14-130 to the Real Property Code, “Installation and Use of Clotheslines on Residential Property.” My HOA, Woods of Bayview, Havre de Grace, MD in Apr-May 2017 changed the HOA Bylaws and rules to ban clotheslines as the HOA told me “they look tacky.” Make sure your HOA does due diligence in reviewing the county and state regulations before passing rules. There is substantial local opposition to the siting location of a 350 acre solar farm in Florida and it is being defended using Fl Statute 163.04 stating that prohibiting the installation of solar collectors is expressly prohibited. Is that an allowed legal interpretation of this statute?! My mom, sister and I have always line dried our clothes when able. If unable, unless we need them immediately, we wait until weather permits or hang in our shower on hangers. I feel it’s kind of rediculas that some places do not allow “line drying”. Do we not live in the land of the free? I guess not. Wow I feel it would be better if we did. I have had my dryer over a year, it’s broken, and I don’t care because a lot of people have clothes lines here in Oklahoma. I guess I am glad I live rural and don’t have to deal with this kind of petty drama just to do my laundry. Lol this all sounds crazy to me. My name is Fiona and I live in Dunedin in New Zealand and over here in New Zealand we are able to hang out our clothes any time of year but sometimes I may have to use my dryer in the winter. Add Waycross, Ga to list of cities banning! They’ve made the wording very tricky and put all kinds of stipulations on it which means most people can’t use them or have one at all. There’s no mention of grandfathering in those that already have them mounted in their yards. Unfortunately for Texas for CONDOS (d) A property owners’ association may include or enforce a provision in a dedicatory instrument that prohibits a solar energy device that: (2) is located on property owned or maintained by the property owners’ association. So balconies which ARE maintained by the CONDO association cannot be used to dry clothes. In theory I could hand something from a window, since I’m responsible for the window. But they would say I’m altering the window to a non approved window.